A devastating recovery has seen Pascoe Vale trump Dandenong Thunder 5-2 at Hosken Reserve on Friday night. Dandenong raced out of the blocks by scoring 34 seconds in, before Paco knocked in five goals to put the game beyond sight. A late Thunder goal was nothing more than a consolation. Ahmed Yusuf kicked off proceedings only seconds after the kick off itself, shocking the home side with a delightful finish into the bottom corner. Dandenong’s lead only lasted eight minutes though when Michael Ferrante’s clever dink picked out Adam Nakic at the back post, who managed to power the ball home with his head. The comeback was complete only a minute later; it was Jake Nakic on this occasion that sent the home crowd into raptures with a thunderous drive. Paco skipper Joseph Youssef then went agonisingly close to adding a third, but his tame shot from close range was unable to beat Zaim Zeneli in the Thunder goal. Davey van’t Schip threatened to put the game to bed early in the second stanza courtesy of a piledriver that bounced just wide of the mark. It didn’t take long before the gap was widened further. It was a Luca Santilli special this time round that deceived everyone in the Pascoe Vale six-yard area on route to the back of the net. Zeneli’s night went from bad to worse midway through the half. His inability to trap the ball from Tomislv Milardovic’s attempt paved the way for van’t Schip to poach and chip an effort beyond the Thunder stop-stopper. Four became five ten minutes from time, thanks to Michael Ferrante’s blast that took a slight deflection on its way into the goal. Nathan Megic’s pull on Veton Korcari a minute later allowed the latter to step up and add some respectability to the scoreboard on an otherwise awful night for the visitors. Dandenong now faces Port Melbourne at home on Saturday week, while Pascoe Vale heads to Galvin Park to face Werribee a day later. 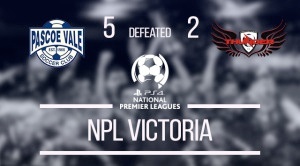 Pascoe Vale 5 (Adam Nakic 9’, Jake Nakic 10’, Luca Santilli 60’, van’t Schip 68’, Ferrante 78') defeated Dandenong Thunder 2 (Ahmed 1’, Korcari 79’) at Hosken Reserve. Pascoe Vale: 35. Alexander PAVLIDIS, 2. Adrian TALARICO, 4. Adam NAKIC, 6. Carl RECCHIA (3. Nathan MEGIC 72’), 8. Joseph YOUSSEF, 9. Jake NAKIC (7. Luca SANTILLI 46’), 10. Davey van’t SCHIP, 16. Tomislav MILARDOVIC (15. Mark PISTININZI 76’), 18. Tom BLACK, 21. Michael FERRANTE, 23. Jake HALLIDAY. Unused subs: 1. Stefaan SARDELIC, 11. Connor KASS. Dandenong Thunder: 1. Zaim ZENELI, 2. Jarryd BARNES, 3. Ramazan TAVSANCIOGLU, 5. Faisal SAKHIZADA, 12. Brendan ELMAZOVSKI, 6. Alan MULCAHY, 8. LEWIS FOSTER (18. Ariel RITZ 79’), 16. Gideon SWEET (19. Abdirahman AHMED 79’), 23. Michael GERACE (20. Chris ENGLAND 46’), 9. Veton KORCARI, 7. Yusuf AHMED. Unused subs: 4. Adam PETKO, 44. Dillon JAKUPI.